Manila—(PHStocks)—Philippine stocks overcame what initially seemed to be another weak trading during the morning session. Trading recovered late in the afternoon session as investors hunted for bargains from three straight days of decline. 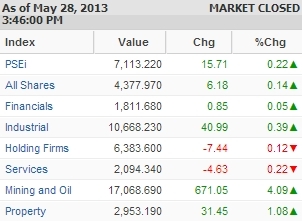 The Philippine Stock Exchange (PSE) index went up by 0.22% to 7,113.22 at the close of trading Tuesday, 28 May. Except for the Holding Firms and Services indices, all counters are back in the green, led by a strong turnaround by the Mining and Oil index, which surged by 4.09%. Meanwhile, the wider All Shares index edged higher by 0.14%. One of the top losers today was First Gen Corporation (PSE: FGEN) after the company shut down its 500-megawatt San Lorenzo natural gas-fired power plant in Batangas after a fire broke out at one of its transformers early Tuesday morning. This prompted a selloff, bringing the stock down to PhP20.55 (-7.85%). Trading was slightly heavy. Value turnover reached PhP9.46 billion on 1.087 billion shares traded. There were 91 gainers against 67 losers, while 46 stocks were flat. The top most active stocks today in terms of value are Alliance Global Group Inc. (PSE: AGI), SM Investments Corporation (SMIC, PSE: SM), Metropolitan Bank & Trust Company (Metrobank, PSE: MBT), Ayala Corp. (PSE: AC), and BDO Unibank Inc. (PSE: BDO).